Our economy is rebounding from the Great Recession but too many hardworking Americans have been left behind. Our economic and political system has lost sight of what matters most:We the People. This year’s Congressional Progressive Caucus Budget provides major job-creating investments in our country through clean energy, infrastructure, housing, and education, which will increase opportunity for all and boost wages for working Americans. These initiatives are fully paid for by requiring the wealthy and big corporations to pay their fair share of taxes. If passed, the People’s Budget would be a down payment on a brighter future for all Americans, providing families struggling to make ends meet with a fair shot at the American Dream. The People’s Budget includes numerous provisions to close persistent racially based inequalities our country faces and, if implemented, would provide stronger paths to equity for communities of color. In addition, the budget: supports a justice system that is fair and effective for all Americans, supports voting rights, makes debt-free college a reality for all students, provides a plan to halve poverty, supports women’s reproductive health, and more. Its infrastructure funding includes replacing aging drinking water pipes, including for Flint, Michigan. 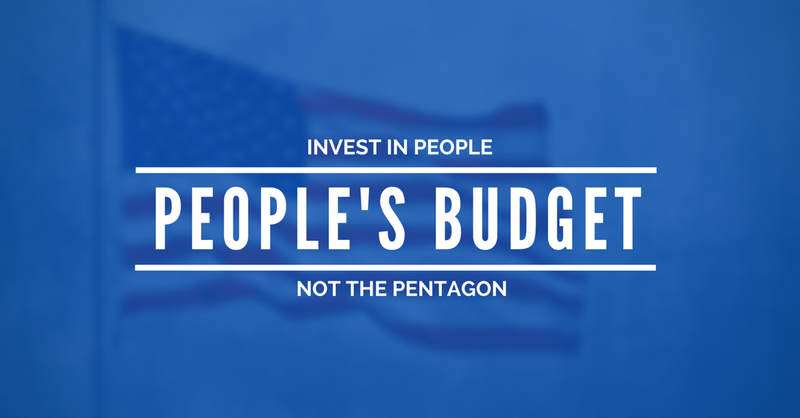 Click here to become a citizen co-sponsor of the People’s Budget and we will deliver your signatures to Congress in support of a plan that puts working families first.